We had about 4 or 5 deer that were roaming the street shortly after the big snow started. We decided it was a good idea to throw our old baby carrots (forgotten about in the drawer in the fridge) into our forest – er, backyard – to give them some extra yummy treats. This morning as I was wandering around the back yard you could see where the deers had been walking around our backyard! so awesome. In the middle of the fun, we decided we would go for a walk in it — it wasn’t horribly cold and the wind wasn’t too bad so we bundled up and headed out. It was great, but also a bit frightening. The snow was very heavy and wet, which the numerous amount of trees in the neighborhood weren’t able to hold up — the sound of the creaking and the snapping was very unsettling. In fact, a neighbor 4 houses down had her tree split right down the middle, just missing her car – but blocking her in the driveway! In addition to that, a large branch of that split didn’t hit the ground — it got stopped by the electric wires and then promptly ignited into a small fire. The power struggled to stay on, and finally at around 10pm it went off and didn’t come back on until 14 hours later. wow…it was frickin COLD in this house. 58 when I got up!! 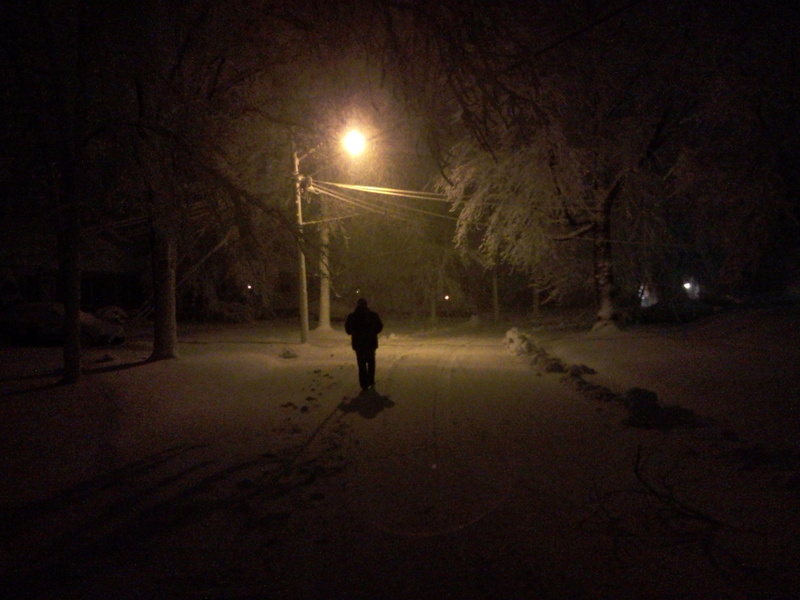 Here’s a pic of the boyfriend walking about 20 feet in front of me during our venture out… more pictures to follow, I ventured out this morning to get more photos of the damage done by the trees.